I've never read a YA Western before but just like that, they became one of the favourite genres of the YA world overnight. Reminding me of Rebel of the Sands, I knew that Bullet Catcher looked like an epic adventure inside the pages and with 4.10 Goodreads rating (which is amazing, by the way!) I was definitely looking forward to reading. Imma is at a loss. In the small town, Sand, she is alone. Imma and her brother Nikko dreamed of running away and escaping to become bullet catchers, the heroes that would go down in history as the legends that could deflect bullets with their hands. But they were wiped out, Nikko too, even though he escaped with promises to return, and now going into the desert lands by herself would be like walking into a death trap. She had no choice but to stay and live out her days washing dishes and thinking about escaping, without being able to. That's until Imma spots a stranger catch someone's bullet, turning it on him, and once she knows that, it became evidently clear that the bullet catchers do live on and she can grasp the hope of leaving Sand, again. Bullet Catcher was just something else. With the world building, character conflicts and journey's throughout the novel, it was unlike anything I've read before in a great way. I couldn't put it down, turning pages like I was thrown inside the book and watching the plot from the sidelines. Not only were there plot twists I wasn't expecting like in other books where they seem unsurprising, but there wasn't even a need for romance in this novel because it was just that good that without the strings of romance, it still worked. There was more to Bullet Catcher than action, there was a ton of character development, mainly Imma, who's journey throughout the book was believable and well written. The family aspect and the guardian/teacher and student relationship of training was written perfectly and was entirely believable. Just because there was action doesn't mean there wasn't emotion, which there was, and the mix of all these fresh, exciting plot points, Bullet Catcher just seemed to pave the way for writing it's own five star review. 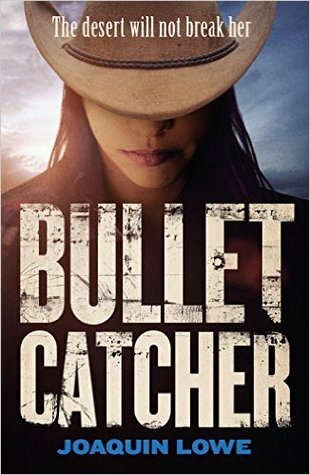 Overall, Bullet Catcher was a lively, immensely entertaining and highly addictive book for fans of YA Western, adventure and mystery. Joaquin did an amazing job of writing one of my favourite books of the year so far! I can't wait to read more about the YA Western genre and see more to come from Joaquin in the future. Five stars completely. Have you read Bullet Catcher?